In my spare time, I play violin – orchestra, rock band, and after last week, fiddle. I returned to Buffalo last weekend from a whirlwind week at a resort in the Catskills that I spent learning how to fiddle from none other than Gaelic Storm, and on top of the fantastic time we had and wonderful people I met, the scenery wasn’t so bad either. In fact, I spent a good bit of time geeking out about the fact that the resort sits on the edge of the Panther Mountain Impact Structure. The Catskill Mountains form the northeastern end of the Allegheny Plateau, a feature created by the uplift and erosion of sediments deposited by the Acadian Orogeny in the Devonian and Mississippian periods (395 to 325 million years ago). Panther Mountain was possibly named for the panthers (or mountain lions, cougers, pumas, or catamounts) that might have lived there in the past, although there haven’t been any panthers around for quite some time. (There are black bears and coyotes, as we found out at the camp). Panther Mountain behind the buildings of the resort that hosted the camp. 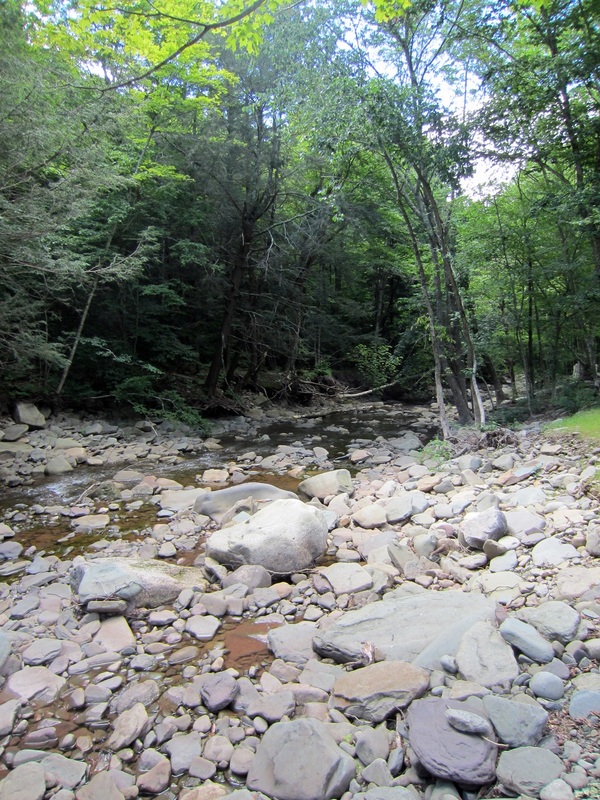 In this area, the bedrock is mainly Devonian sandstones, shales and conglomerates of the West Falls and Sonyea groups. In the streambed behind the resort, there’s a beautiful exposure of some cross-stratified sandstone and lots of cobbles of conglomerate. As you go further west the sediments shed during the orogeny get finer (coarser material doesn’t travel as far), so the conglomerates were formed quite close to the ancient mountains and the sandstones somewhat farther away. Cross-stratification in the bedrock of the creek. More bedrock and cobbles in the creek. The impact structure is an odd one. Panther Mountain itself is an almost perfectly circular 10-km-wide (6-mile-wide) structure which is in itself unusual (unless you’ve got a fairly young volcano, which aren’t that common on this side of the country). But the late Yngvar Isachsen of the New York Geological Survey also noticed that the drainage pattern on the mountain was odd. Normally, streams or rivers on a mountain radiate out from the highest point, like the spokes of a wheel. But the streams on and around Panther Mountain don’t do that. Esopus Creek circles the northern edge of Panther Mountain and Woodland Creek, a tributary of Esopus Creek, completes this annular drainage pattern to the south. (If you want to drive it, Route 28 follows Esopus Creek through the valley around the northern edge of the structure). Excerpt from the USGS Pepacton Reservoir 1:100,000 topographic map; scale has meters on the top and feet on the bottom. Panther Mountain is labeled just under “SHANDAKEN”, which is the name of the town on the northern edge of the structure. Confirmation of the Panther Mountain impact crater, Catskill Mountains, New York, and preliminary ideas concerning its age. Isachsen, Yngvar W.
Geophysical surveys have indicated that there is a small gravity low over the mountain which would be consistent with low density breccia in the center of an impact crater. Also, the Panther Mountain structure is a great example of inverted relief; the valley through which the creeks flow would have originally been a positive feature associated with the impact crater’s rim collapse fault, but a higher degree of fracturing in the crater rim the faulting in that area meant that it was preferentially eroded instead of the crater interior (Panther Mountain itself). But the iron spherules and ‘shocked’ quartz in the well cutting are pretty conclusive – you just don’t get shocked quartz unless you have an impact or an atomic explosion, and it’s safe to say that there wasn’t any atomic testing going on in New York in the Devonian (or ever). The crater has been dated to about 375 million years, and would have formed in a shallow sea that was filling with sediments from the erosion of the mountains forming in the Acadian Orogeny. So, it turns out that New York has its own history of cosmic invaders. In fact, Nadia Drake wrote about another impact crater, buried, that was discovered in the Finger Lakes only a few years ago, which brings the state up to two craters! It’s entirely possible that there are more, but they are – like these two – buried under layers of sediment, razed by glaciers, or otherwise eroded away. It’s much harder to find a pristine impact crater in a reasonably wet environment like the Eastern US, since there are so many processes at work modifying the landscape here (unlike in drier areas, which tend to preserve these kinds of structures better). At any rate, it was pretty neat to spend a week learning to fiddle on the edge of an impact crater – and in a really beautiful setting! Looking out of the crater from the valley formed by the eroded rim. Como, M. and Revetta, F., 2011, Interpretation of geophysical data over Panther Mountain circular structure. Geological Society of America – Northeastern (46th Annual) and North-Central (45th Annual) Joint Meeting (20–22 March 2011), Abstracts with Programs, Vol. 39, No. 1, p. 59. Isachsen, I.W., 2000, Confirmation of the Panther Mountain impact crater, Catskill Mountains, New York, and preliminary ideas concerning its age. Abstracts with Programs – Geological Society of America, 32, 7, 452, Geological Society of America, 2000 annual meeting. Isachsen, Y. W. et al., 1994, The Panther Mountain circular feature possibly hides a buried impact crater. Northeastern Geology, 16, 2, 123-136, Highlights of New York State geology; symposium proceedings in honor of Robert G. LaFleur, 1994. Ochhi, M. and Revetta, F., 2011, Is Panther Mountain circular feature a crater? Geological Society of America – Northeastern (46th Annual) and North-Central (45th Annual) Joint Meeting (20–22 March 2011), Abstracts with Programs, Vol. 43, No. 1, p. 84. After Celtic comes Cajun. It’s a slippery slope. This is one of the bands I play with. Great post and topic, Jessica. “Back in the day” some of my undergrad student colleagues at Potsdam spent much of a summer (’75) traversing over Panther Mt. with a Worden gravity meter to get some of the geophysical data, you mentioned, for geophysics professor Frank Revetta, and Yngavar. They had some good stories (which I have sadly forgotten now). Panther Mt. is a fantastic geologic story. Great that you were able to experience it along with doing the music. I am a teacher who teaches gifted children 2nd-4th grade at a school in MS. One of the areas of interest of my classes was volcanoes. I was wondering if my classes could write you a letter? If this is possible, could we have a mailing address?